Field trips are booked up through the Spring 2019! Summer field trips can be booked now and are filling up fast! Looking for a wild experience for your class? 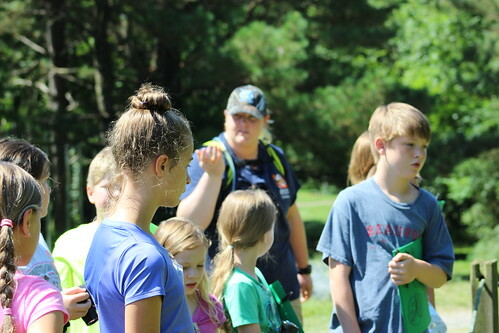 Our educational field trips aren’t “Just the facts, ma’am.” Our trained volunteer tour guides will present the facts in an age appropriate and fun loving manner. If your class is very lucky, one of our tigers might just spray you! This is a walking tour along a gravel path, lasting around 1 ½ hours. You will be introduced to lions, tigers, and other exotic species of carnivores. Your group will be as close as 3 feet from the enclosures (plenty close enough to appreciate the size of the animals’ claws and teeth!) 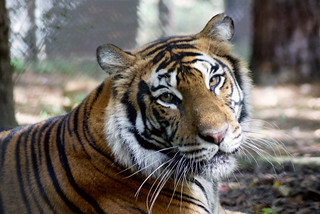 You will learn Carolina Tiger Rescue’s history, species information, and the personal story of each animal you meet. Field trips may be scheduled on Mondays, Wednesdays, or Thursdays throughout the year, and we can only accommodate 100 people in a single day. This number includes students, chaperones, and teachers. Groups larger than 100 people will need to schedule field trips for multiple days. In order to accommodate your preferred dates, please plan your field trip at least 2 months in advance. Summer field trips tend to book up by the end of April and Fall field trips book up by the end of August. Please note that for ALL field trips, the minimum payment of $160 ($170.80 with tax) is due at the time of the reservation to secure your spot. The rest of the payment is due at the time of the field trip. $160 minimum for up to 20 students; additional students are $8 each. Parent Chaperones are $10. Children of all ages are charged. Faculty are free. Price is before sales tax. $210 minimum for up to 15 people; additional people are $14 each. Faculty are free. Price is before sales tax. $160 minimum for up to 16 people; additional people are $10 each. Everyone is charged. Price is before sales tax. Faculty is free. The minimum payment is due at the time of the reservation. The following information will be needed when filling out the field trip request form. If you have any questions about our field trips, contact our education director, Katie Cannon. Are you ready to request a field trip? Please fill out the form below. Once your field trip is scheduled, you will receive a confirmation email with the details of your field trip and the minor child release form. In order to ensure that you have a wonderful field trip, we have put together some tips for you. If you have any questions, please don’t hesitate to contact Katie.